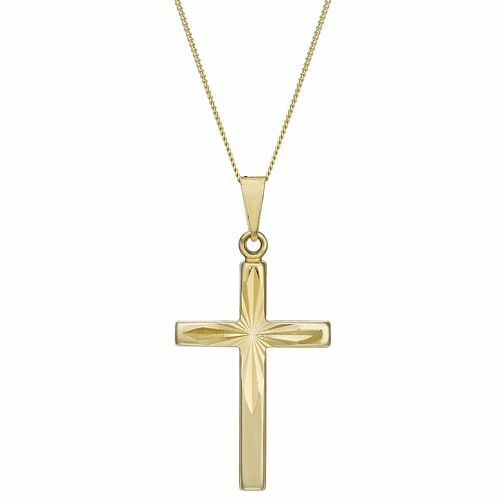 Give a stylish and thoughtful gift, with this classically elegant 9ct gold cross pendant, crafted with diamond cut detailing and finished with an 18" chain. 9ct Gold Diamond Cut 18" Cross Pendant is rated 4.5 out of 5 by 2. Rated 4 out of 5 by Anonymous from Great product! The quality was great and the pendant exactly what I was looking for, the only fault is that the chain is a lot thinner than shown on photos... apart from this amazing product! Rated 5 out of 5 by Anonymous from Beautiful! Bought for me for xmas, perfect size, and the lines catch the light in a lovely way.